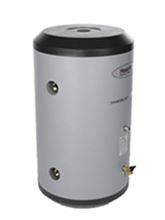 Heat-Flo 316 Stainless Steel Hydronic Buffer Tank with 60 Gallons, 1-1/4 inch Connections and 4 Taps - HF-60-BT-114. The primary application of a buffer tank is to Eliminate Short Cycling, reduce heat pump, chiller, or boiler short cycling. Hydronic buffer tanks are used in systems operating below the design load condition, which is most of the time, or in systems having several low BTU cooling or heating loads calling at different times. This can cause the heat pump or the boiler to short cycle, resulting in reduced operating efficiency and shorter equipment life. A 3/8 Inch ID thermal well is located mid-tank. Thermistors can be inserted 3 inches into the well, or the well will accept the Honeywell L6006A Controls. The primary application for the HF-60-BT-114 is to reduce low-mass modulating, condensing boiler short cycling. The supply side of the boiler is piped through your closely spaced tees and then to the top of the tank. The lower side port is then piped to the return port on the boiler.